Martat 1/2014, s. 36 - 38, "Esiäidin käsistä". Instructions without thumb (flat), drawings how the yarn goes under-over, Russian Stitch 2+2+2 F2. Novita's Lapaslehti 24.1.2014, s. 24, 81 - 83 (no 17). Colour photos, easy way to start (same as in Kotiliesi 6/10), instructions with thumb. Finnish Stitch 2+2. 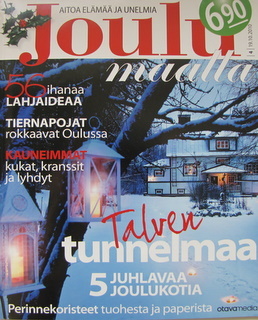 Maalla magazine 4/2010 (Christimas special), p. 85 - 86. Instructions withouth thumb (flat), Russian Stitch 2+2+2 F2. Kotiliesi 6/2010 (Easter special) Instructions for nalbinding a hat, "Poronsuolilankaa ja hirvenluuneuloja - Keskiaika käsissä", p. 66 - 70. Colour photos, easy way to start, instructions with thumb. Finnish Stitch 2+2 F2. Koti magazine 2/2010 (can be found in some of the libraries in Finland) Article "Kintaita neulomaan", p. 13 - 15, with step-by-step colour photos, instructions with thumb, Oslo Stitch. Taito 6/2009, p. 38 - 39 (libraries), "Mummon neulakintaat ja faaraon sukat". No instructions, but a link to the pdf instructions of Kulttuurien museo (instructions with thumb, Oslo Stitch). Karjala 1.11.2007, no 44, p. 9, (library archives) "Perinteiset neulakintaat ovat haaste kädentaitajille". No instructions! Kurkijokelainen 19.11.2004, no 46, p. 6, (library archives) "Karjalaiset toivat neulakintaat uudelleen Länsi-Suomeen". Instructions without thumb (flat), drawings how the yarn goes under-over. Finnish Stitch 2+2 F2. Suuri Käsityölehti 1/2003, p. 47 and 63, "Lapaset neulakinnastekniikalla". Instructions without thumb (flat), drawings how the yarn goes under-over. Finnish Stitch 2+2 F2. Koti magazine 10/1995, p. 12 (I'm afraid this is not available via libraries anymore; I got a copy from the publisher) "Vanha työtapa neulaaminen". Instructions without thumb (flat). Drawings how the yarn goes under-over. Very short and sketchy instructions on making a sock. Short instructions also for a mitten. Russian Stitch 2+2+2 F1. Taito 1/1995, p. 32 - 33 (libraries), "Vanha työtapa käyttöön - neulakintaat lämmittämään". Drawings, photos, instructions with thumb. Broden Stitch. Kotiliesi 2/1982, s. 77 - 78, "Neulakintaat". Drawings, colour photos, instructions with thumb. Finnish Stitch 2+2 F1. (Though, the mittens on p. 77 are probably made with Russian Stitch). Suuri Käsityölehti 2/1980, p. 60 - 63, "Vanhaa käsityöperinnettä: Neulakinnas- ja viitelöintitekniikat". Instructions for two nalbound hats and mittens. Photos on how to start, and how the loops sit around thumb and behind thumb, drawings how to pivot (turn at corners), also photos on thumb opening and starting a thumb. Finnish Stitch 2+2 F1 (hat), and Finnish Stitch 2+2 F2 (mittens). Omin käsin magazine 4/1968, s. 16 - 17 "Terittäen tehty kinnas - suomeksi, venäjäksi ja pyöräyttäen ommeltu, punaltaen tehty". Black and white photos, drawings, and written instructions for Finnish Stitch, Russian Stitch, and Finnish Turning Stitch. Kotiteollisuus magazine 2/1957 (library archives), article by Tellervo Soisalon-Soininen "Vanhaan tapaan valmistettu kinnas III". Vanukinnas. No instructions, but it is said to follow the instructions of the Polvijärvi mitten (same magazine, issue 10/1956), and to take only one connection stitch instead of two. Kotiteollisuus magazine 1/1957 (library archives), article by Tellervo Soisalon-Soininen "Vanhaan tapaan valmistettu kinnas - II". Drawings, instructions with thumb. Russian Stitch 2+2+1 (Sakkola Stitch), and Russian Stitch 2+2+2. Kotiteollisuus magazine 10/1956 (library archives), article by Tellervo Soisalon-Soininen "Vanhaan tapaan valmistettu työkinnas". Step-by-step photos (black and white). Russian Stitch from Polvijärvi 1+2+2 (Polvijärvi Stitch), instructions without thumb (flat). Kotiliesi 22/1932 (library archives), p. 886 - 887, article by Aino Nissinen"Kintaan ompelua". Drawings for Dalby Stitch. Nissinen shows to start by crocheting a chain of chain stitches first, and then switch to nalbinding by lifting the last loop around thumb. Manipulating the loops is shown in a similar way as in the Fataburen magazine (link). Drawings on how the yarn goes under-over also for Russian Stitch 2+2+2 F1. A photo title says "The old generation still knows how to nalbind mittens." Hanna Martikainen, Master's Thesis "Åbo Akademin tontin neulakinnastekniikalla valmistetut tekstiilit - kokeellinen näkökulma", 6/2015 (link). Laura Hämäri, Master's Thesis "Kinnasneulatekniikan muutos perinnekäsityöstä muoti-ilmiöksi", 5/2011 (link). Martta Mäenpää, Master's Thesis "Kinnasneulatekniikan verkko-oppimateriaalin kehittäminen ja neulalla neulomisen taidon kehittyminen", 6/2010 (link). Marjut Nordberg, Master's Thesis "Käsityökohtaamisia muinaisuuden kanssa - Neulalla neulominen eli kinnasneulatekniikka... muutakin kuin neulakinnas?" 4/2008. A couple of inaccuracies in defining the 1-phased and 2-phased nalbinding, plenty of colour photos (link). Krista Vajanto, Master's Thesis "Euran emännän neulakintaat", four videos (suomeksi (Finnish Stitch), venäjäksi (Russian Stitch), pyöräyttäen (Finnish Turning Stitch), and kerrokset (second row) 4/2003. 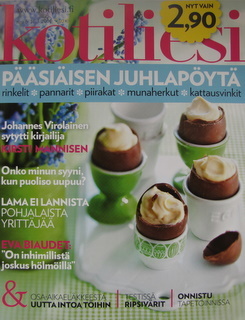 Also information about plant dyeing, colour photos on archaeological finds in Finland, etc (link). Kaisa Leinonen, Master's Thesis (2000), "Neulakinnasperinne Suomessa",via libraries. Drawings and diagrams on different stitches. Estimates the prevalence of knowing the nalbinding, sort of continues T-I Kaukonen's work. Not available on the internet. Irma Korhonen, project work at a handicraft school (1980, Kuopio), "Kinnasneulatekniikka pyöräyttäen", original piece loanable as an inter libraray loan, includes samples of Finnish Stitch, Russian Stitch, and Finnish Turning Stitch, and also a pair of mittens Korhonen made as a part of her project work, made with Finnish Turning Stitch. Photos, short texts. Instructions for Finnish Turning Stitch in the "drop and pick" method. Not available on the internet. "Kinnasompelun levinneisyys ja työtavat Suomessa", Suomen Museo 1960, p. 44 - 71. Maps, photos of old nalbinding needles and mittens. Diagrams for Finnish Stitch 2+2, Russian Stitch 2+2+2, and Finnish Turning Stitch 2+2+tr (in the Parikkala style), Kaukola Kekomäki Stitch, and also a diagram for Mordovian leg warmers (though, I think the written text about the Mordovian Stitch is confusing and ambiguous). 16 different stitches are mentioned: Finnish Stitch (FS) 1+1 (Oslo Stitch), FS 1+2 (Mammen Stitch), Kaukola Kekomäki Stitch, FS 2+2, FS 2+3, FS 3+3, Russian Stitch (RS) 2+2+2, Russian Stitch "with five loops" (not specified, but could be e.g. 2+2+1 or 1+2+2), RS 3+2+2, RS 3+3+3, RS 2+2+3 (Salmi Stitch), RS 1+1+1 (Dalby Stitch) Finnish Turning Stitch (FTS) 2+2+tr, FTS 2+2tr à la Parikkala style. In addition, stitches "full Russian" and "half Russian", and "full Carelian" and "half Carelian" are mentioned, but T-I Kaukonen does not specify them. Those same terms can be found in old nalbinding samples in the Museum archives. Tyyni Vahter, "Tuukkalan neulakinnas". 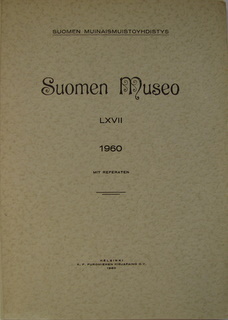 Suomen Muinaismuistoyhdistyksen aikakauskirja 1934, p. 236 - 243 (as an inter library loan). Diagram of the Salmi Stitch (p. 238). Note, the Tuukkala man's mitten mentioned in the article is not made with Salmi Stitch 2+2+3, but with Finnish Stitch 2+2 (ref. T-I Kaukonen 1960; K Vajanto 2003). Tellervo Soisalon-Soinenen, "Aineistoa neulakintaiden valmistuksesta Polvijärvellä, Sakkolassa, Äyräpäässä ja Kuolemanjärvellä 1950-luvulla", 17 pages, photos, handwritten notes. The materials were collected in 1953-1957 (Museoviraston kansatieteellinen käsikirjoitusarkisto). From Polvijärvi: Instructions on Russian Stitch 2+2+2 F2 (yarn often spliced by knotting). From Sakkola: Instructions on Sakkola Stitch 2+2+1 F2 (yarn spliced by knotting). From Äyräpää: Instructions on Finnish Stitch 2+2 F2, and Finnish Stitch 2+3 F2 (yarn spliced by knotting, or by twisting). From Kuolemanjärvi: Russian Stitch 2+2+2 F2 (yarn spliced by knotting). It was interesting to note in these materials that making knots to join pieces of yarn was a common practise in those areas!